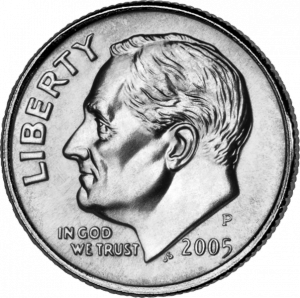 A dime is 2.268g, with a value to gram ratio of .2268g per cent. By contrast, the utterly lazy penny is 2.5g per cent, the slacking nickel is 1.0g per cent. Only the quarter comes close at .2268g per cent, but the quarter is 24.26 mm, vs. the dainty dime's 17.91mm. The quarter recently was recently featured in "State Quarter" edition, where the mint featured all 50 states on the backs of the quarter. The dime has had no such redesign, choosing instead remain consistent since it's redesign with Franklin D. Roosevelt's head in the 1940s. A roll of dimes has 50 coins, and costs $5.00. A roll of quarters has 40 coins, but costs twice as much. The dime is all about hard working value. "The dime novel", "The March of Dimes". By comparison, the quarter is referred to as "two bits", which can be used in the pejorative "He's a two-bit lawyer". Which is cooler: "Dimebag" Darrel, or Nickelback? In the late 1980s you could make a telephone call on a public pay phone with two dimes. At the time, putting in a quarter yielded no nickel as change. So, the next time you head to a parking meter with a handful of change, remember the hardest working coin in USA currency. Deposit those dimes into the vending machine with pride. When someone asks you for a quarter, give them three dimes instead. And tell them "keep the change. I don't need your lazy nickels".